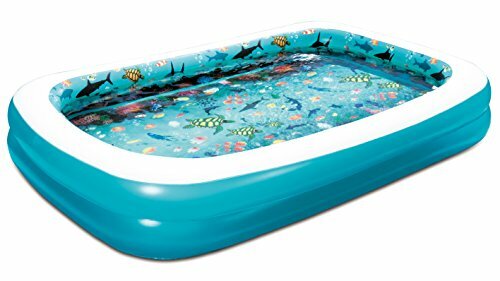 SUMMER WAVES 103''x69''x18'' 3D Rectangular Family Pool with 1 Pair of 3D Goggles. Bring the entire family together for some refreshing fun with the Summer Waves 3D Family Pool. This inflatable pool is generously sized and features bright 3D ocean images. Put on the included goggles, and have a blast swimming around the pool with life like fish and other sea creatures. Measures 103 X 69 X 18". Water capacity: 210 gallons. (60%).